It’s an interesting- albeit disappointing- decision not to continue on directly with the broken relationship between Clara and the Doctor that was left at the closing of ‘Kill the Moon.’ Instead, time has passed and the two are chatting merrily together, surprising even if Clara has decided to take Danny’s advice and return for only one final trip. 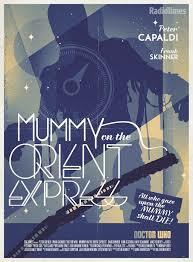 Regardless of that odd gap in time that remains unexplored, ‘Mummy on the Orient Express’ offers a spooky and enjoyable tale, starting tensely with a 66-second countdown on screen. People are dying on the outer space version of the famous train, and they get 66 seconds of life after seeing the titular mummy. Nobody else can see the creature, instead only seeing someone terrified for his or her life for just over a minute before suddenly dropping dead. In terms of setting the scene, ‘Mummy on the Orient Express’ masterfully executes. This mystery forms the crux of the episode as the Doctor and Clara try to determine how the mummy is selecting its victims and why nobody else can see it. New Doctor Who writer Jamie Mathieson proves adept at the murder mystery format by keeping the tension high and revealing clues at just the right intervals; in short order the Doctor finds that many of the train’s occupants are actually scientists studying the Foretold (the mummy) to find out what it is, that the train is actually a laboratory for said studies, and that the 66-second clock relates to phase shifting and the mummy sequentially choosing passengers with health issues. The Doctor is at his most calculating and callous here, and Capaldi completely delivers the sense that his character is on a mission to solve the mystery regardless of the consequences or lives involved, even if that means sacrificing himself to sate his curiosity. This is certainly a much more militaristic Doctor than is usually present, an interesting trait given how passionately he has spoken against soldiers this entire series. Impressively, the ensemble cast all does an admirable job in distinguishing and selling their period characters. Frank Skinner as Perkins, Daisy Beaumont as Maisie, and David Bamber as Captain Quell are of particular note with their performances, even if the Doctor’s ultimately declined offer for Perkins to join him in the TARDIS seems a bit rushed and unearned. For a creature- and therefore by extension the entire episode- that relies so heavily on CGI, the mummy is brought to life exceptionally well. Never is there a moment where the mummy does not blend in seamlessly with the surrounding environment. Due credit must also be given to director Paul Wilmshurst, returning from ‘Kill the Moon’ which succeeded in delivering its own form of horror, as he again proves adept at capturing the perfect angles and pace to deliver a solid unnerving experience. After the grand spectacle of those claustrophobic proceedings, the question still remains of where exactly this leaves the Doctor and Clara. Clara has a wonderfully poignant scene with Maisie where she discusses just what has brought them to this situation and if she really wants the Doctor out of her life completely. She is tired of the lies and manipulations, and the fact that he made her lie and to become complicit with his lies is a step too far. It would have come as no surprise had Clara chosen to leave at that point and to never look back. Whether due to a realization during her conversation with Maisie or during a heartfelt talk with the Doctor himself, though, the door has not been shut completely on their travels together just yet. A tenuous opening remains, and it will be intriguing to see what comes of these scenes going forward.